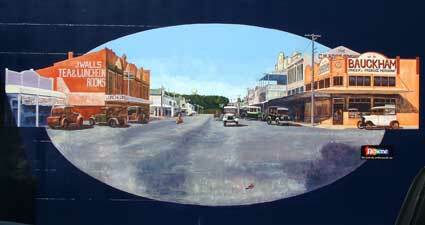 This late 1920's scene changed little until 2002 when the New World Supermarket replaced the Moutoa Buildings (occupied at the time by J Walls) and Whyte's Hotel. On the opposite side of the street the Perreau Building's verandah stands out. At the far end of Main Street stands the water tower which was completed in 1923 and was a milestone in the town's history as the high pressure supply reduced the number of disastrous fires and enabled the town swimming pool to be built. Two other murals that were inside buildings are below. 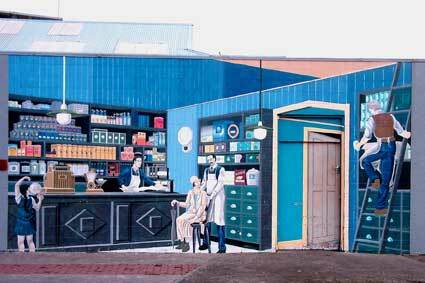 The door in this mural often caused confusion! Unfortunately it is no longer in existence as the building has been replaced. 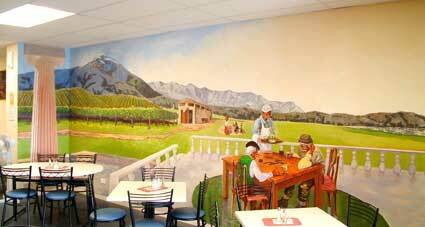 This mural is no longer available to view. 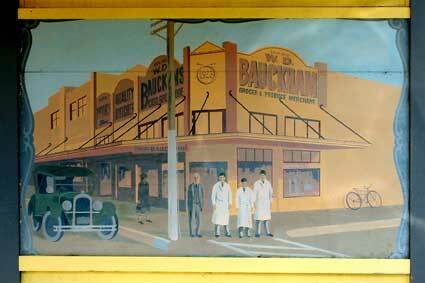 This mural, no longer viewable, used to be inside what is now the Post Shop.